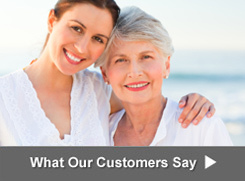 Why Choose Iowa Memorial Granite Company? 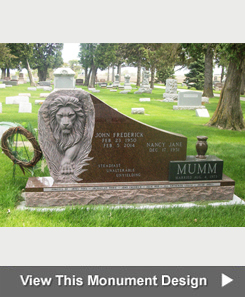 The Iowa Memorial Granite Company designs and produces headstones, bronze markers, granite memorial benches, gravestones, grave markers and cemetery monuments. 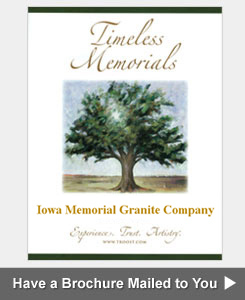 Iowa Memorial Granite Company does all design work, allowing us the ability to change design anytime in the process. Iowa Memorial Granite Company does all finishing work, from blasting to etching. This ensures that your headstone is produced with the highest of quality, guaranteed by us. Iowa Memorial Granite Company only asks for half down and rest upon completion and offers an interest free payment plan, easing the financial burden. Iowa Memorial Granite Company provides a scaled proof of your gravemarker BEFORE blasting, giving you the opportunity to see a preview of the memorial and make any changes you might desire. Iowa Memorial Granite Company sets their headstones on granite rather than cement. Cement, will break down and crack over time, leaving an unattracitve and unprofessional looking foundation. Granite will retain its appearance and ensure for hundreds of years. Iowa Memorial Granite Company does their own installation. Our setting team is skilled in cemetery monument installation and has industry-tailored equipment to safely and properly install your memorial. Iowa Memorial Granite Company deals specifically with the best vendors and due to our buying power, has the capability to reject any piece if it does not meet our stringent guidelines. This means your family is GUARANTEED THE BEST GRANITE AVAILABLE. Iowa Memorial Granite Company offers a written warranty on all granite products that we produce. This warranty never expires. Iowa Memorial Granite Company guarantees your satisfaction. Iowa Memorial Granite Company employs craftsmen with an average of 20 years in the memorial industry. This ensures that all headstones produced are of the highest quality. Iowa Memorial Granite Company uses a state of the art design program to ensure accuracy in design as well as provide our customer with a huge selection of design options to choose from. The days of picking from 2 or 3 options are long gone. Iowa Memorial Granite Company is able to obtain any granite upon request and duplicate any memorial in the cemetery. Memorial duplication requires skilled craftsmen to identify and duplicate an existing gravestone. Iowa Memorial Granite Company employs two MBNA certified designers to assist with everything from a standard grass level marker to the most unique of family estates. Iowa Memorial Granite Company is conveniently located in Muscatine, Iowa. 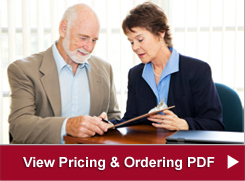 In addition, our sales team and designers are available for in-house, cemetery or funeral home meetings. Iowa Memorial Granite Company has been in business since 1943. Iowa Memorial Granite Company stocks one of the largest inventories in Iowa and has access to 6 other inventories in the state, helping to provide better delivery times for your families when the situation arises. Iowa Memorial Granite Company has excellent knowledge of cemetery rules, regulations and caretakers-an important tool when designing memorials. Iowa Memorial Granite Company has records dating back 40 years to allow for easier duplication and genealogical research. Iowa Memorial Granite Company can provide over 300 different color granites from around the world. Unique colors are now affordable and can be implemented into the design of your families' memorials. Iowa Memorial Granite Company has a new production facility as well as setting equipment to ensure that your families' memorials are designed, produced and delivered with the care and attention to detail that it deserves.